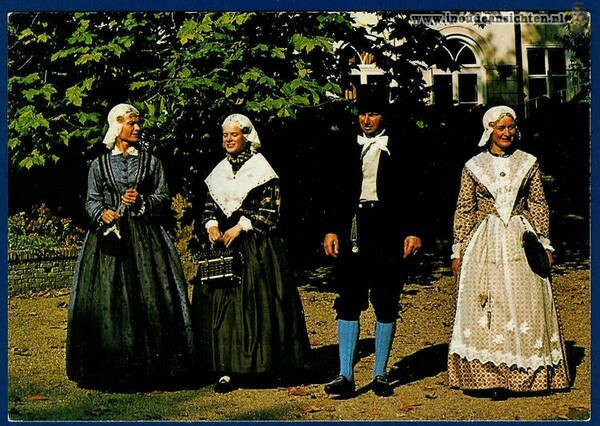 Today I will talk about the costume of Friesland in the Netherlands. Europe is, in general, the most uniform part of the world, Ethnically and Linguistically speaking, which is the result of the tradition of Nation-States. Many small ethnic groups have been assimilated at a greater rate compared to Asia or Africa. Nevertheless, there are still about 100 languages spoken on the continent. Even in western Europe there are minority languages still extant. One of these small ethnicities are the Frisians. Here is a map of Historical Friesland, which consisted of the north sea coastal area from the Netherlands to Denmark. 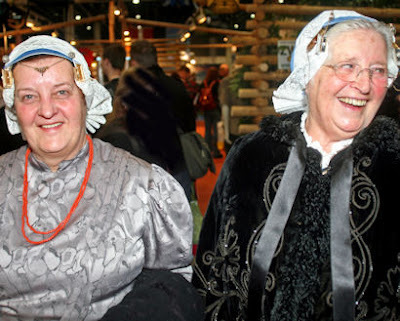 Today, most Frisians have been assimilated by the Danish, German, and Dutch peoples. The Frisians are divided into three groups, the West Frisians, the East Frisians and the North Frisians. They speak a language, or three closely related languages of their own, which are closely related to English, and very distinct from Dutch, German, and Danish. Here is a map showing the current extant of the Frisian Language(s). There are currently about 500,000 speakers of Frisian, the vast majority of which speak West Frisian. I will be focusing on the West Frisians and their costume today. 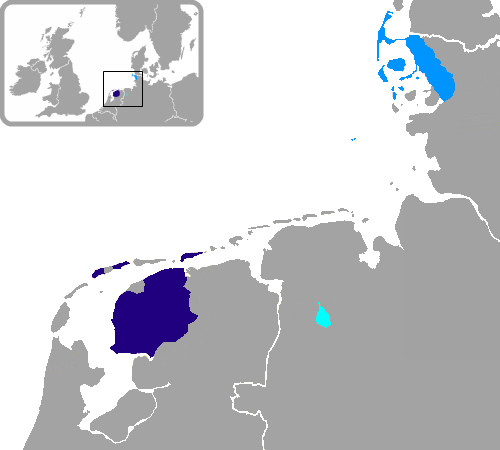 West Frisian is recognized as a language in the Netherlands, and the Frisians have their own Province, which is officially called Fryslân in the Frisian Language, and simply Friesland in Dutch. I should mention that in the Netherlands, there is another region called West Friesland, which is part of North Holland. Here is a map of Friesland and its position in the Netherlands. 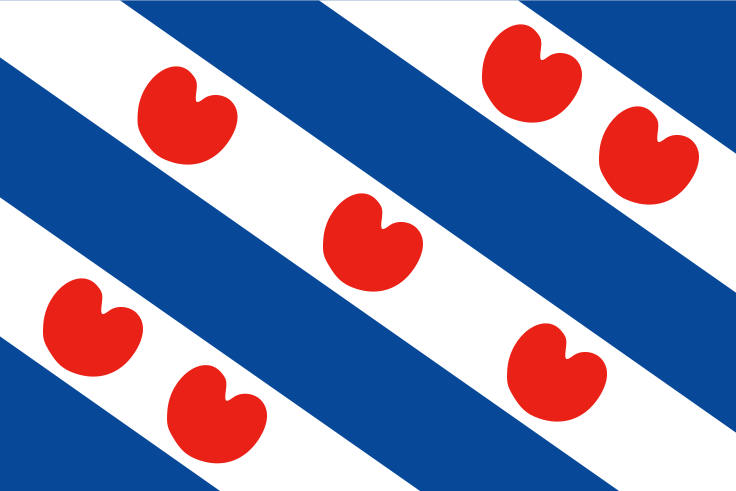 And here is the flag of Fryslân. There is a flag which has been designed to represent all the Frisian People, but it has not been officially adopted by the InterFrisian Council. 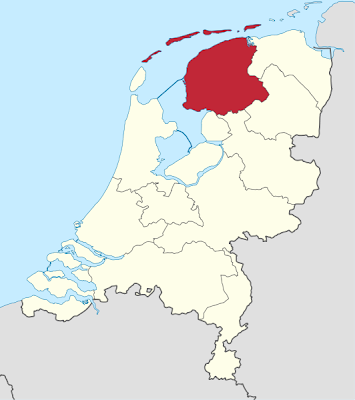 Fryslân is an area with very rich farmland, and so the farmers in this area are historically quite well off. 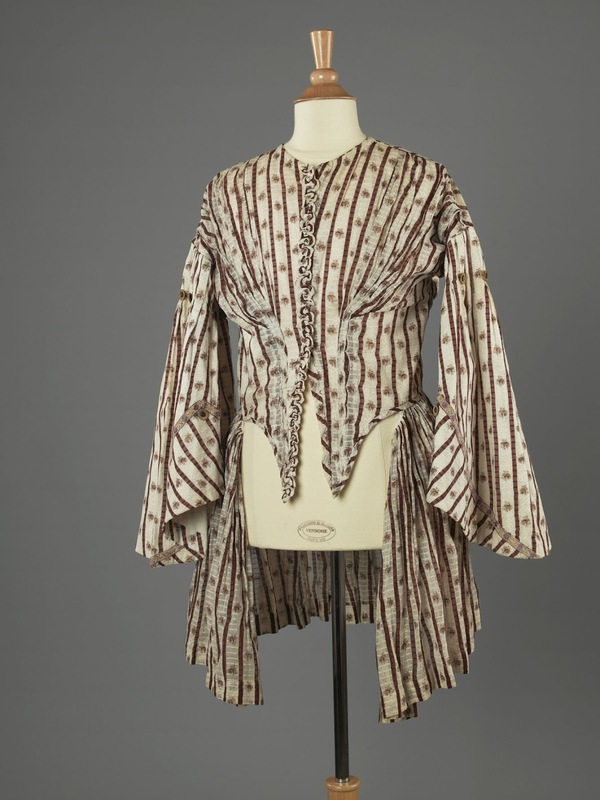 The costume of this area reflects this, being based on the Burgher's costumes of a couple of centuries ago. 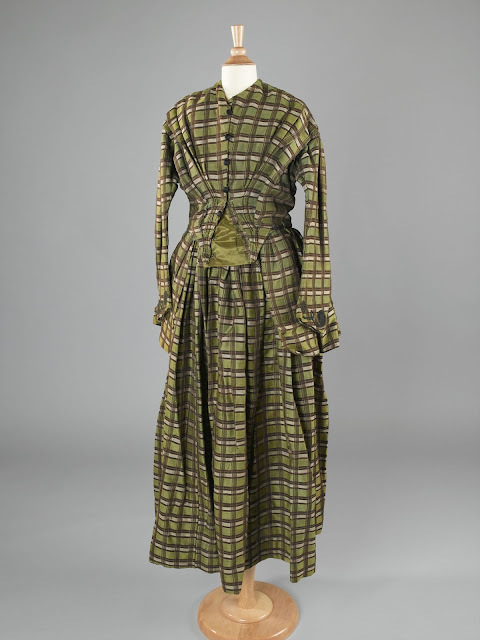 The basic parts of the woman's costume is a full skirt, the rok, and a blouse/jacket, the jak, with a skirt gathered into the waist which reaches to between hip and mid thigh. There is a chemise, the sleeves of which sometimes show, a petticoat, or more than one, and most likely bloomers underneath. This is essential to keeping the line of the skirt. 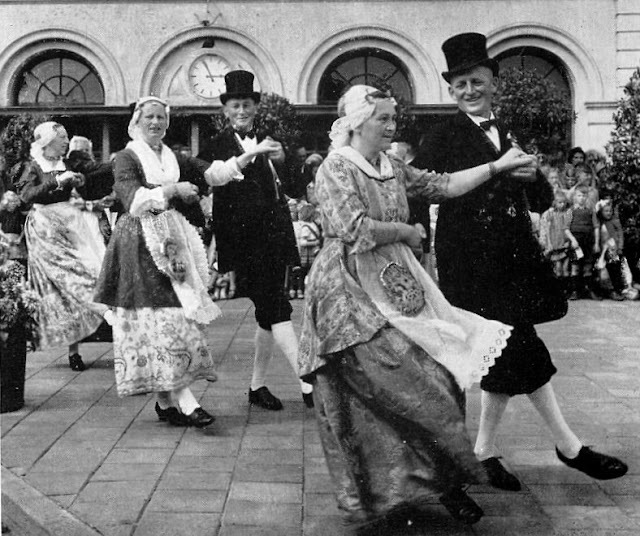 A regrettable tendency among some modern dance groups, especially in America is the omission of the petticoat. This results in the skirt sticking to the legs, and hanging limply in too narrow a fashion, as in this photograph. The other mistake is that the hair should not be visible. 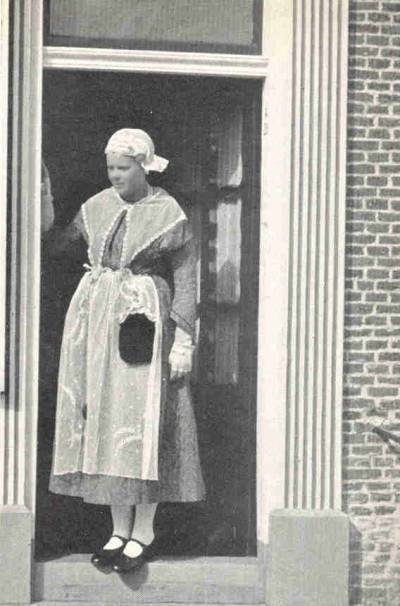 Other than that, they did a reasonable job, but i will only present this one photograph from America, the others are all from Fryslân. 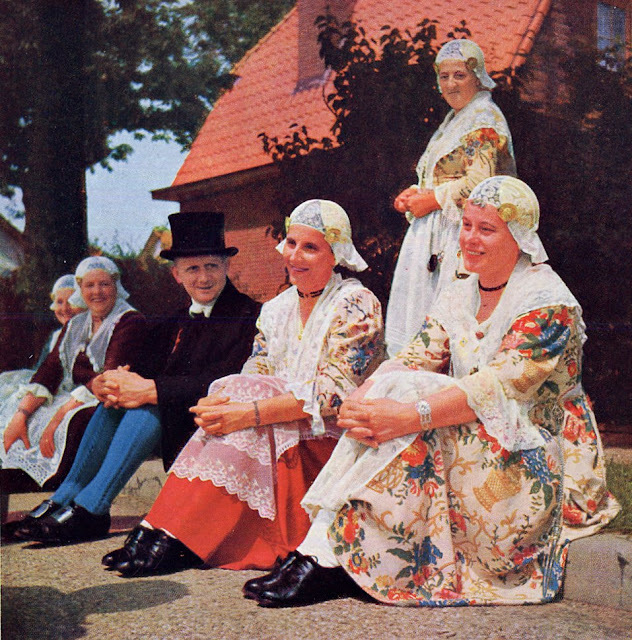 The jak en rok are made in many colors, with many differences in detail in cut, especially of the sleeves. 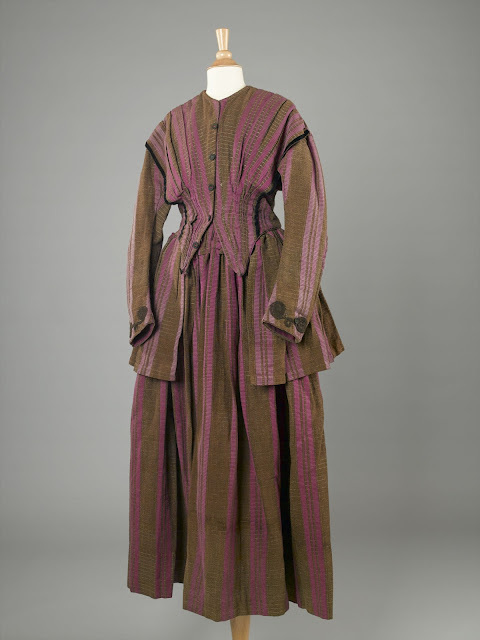 There is some resemblance to the traditional Welsh costume, but the overall effect is quite different. Here are some examples of the jak en rok. Less costly materials are used for everyday wear. As you can see, most of the time, the jak and the rok are made of the same material, but not always. 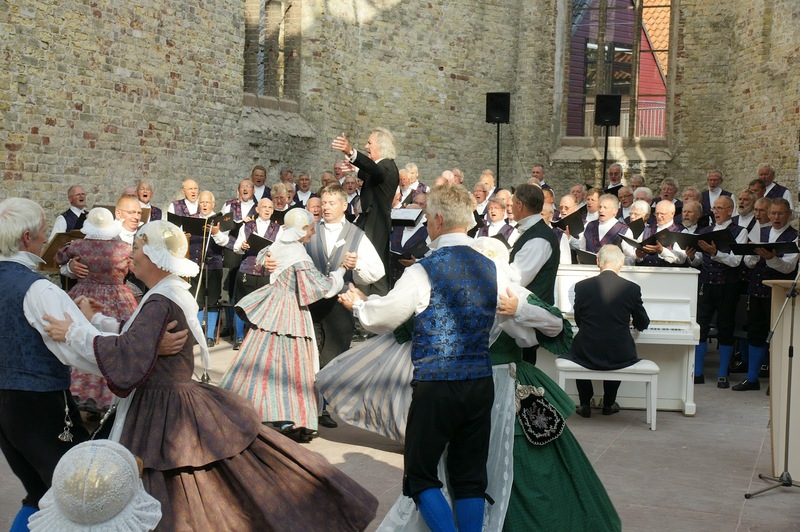 Here are some dancers from West Friesland. On Sundays, or for special occasions, richer materials are used. The neckline of the jak varies somewhat. 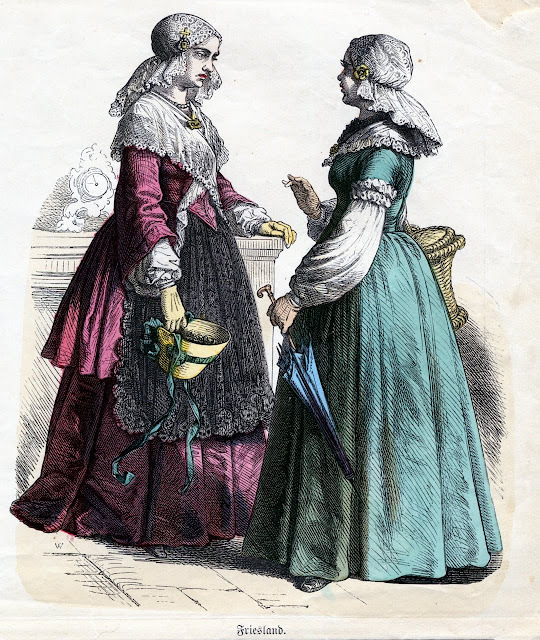 There is a triangular fichu worn over the shoulders, and an apron worn over the jak. Here are a couple of women dressed in everyday attire. The one on the left is wearing a plaid jak en rok and an apron of solid cloth. The lace sleeves of the chemise are visible. 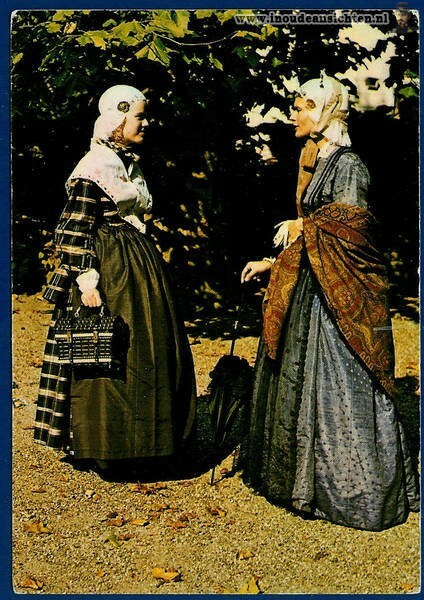 Her accessories, which are usual, consist of a pin holding the fichu closed, as well as a purse and chatelaine hanging from the waist. The woman on the right is wearing jak en rok of plain black and a fichu of calico. She also gives us a good look at the headress which is specific to this region. When a woman is grown, her hair is cut short. 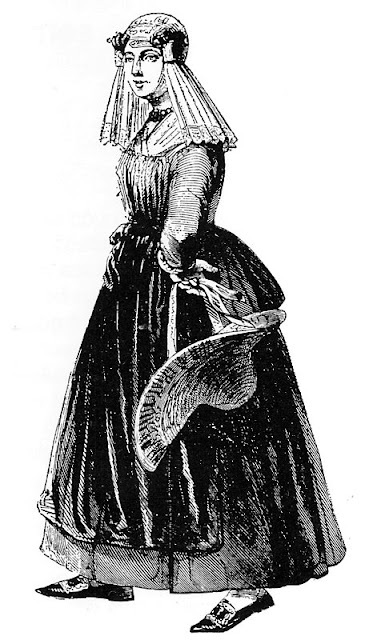 She then wears a cap of white eyelet linen and over that, a black cap. These are both visible in this photo above. 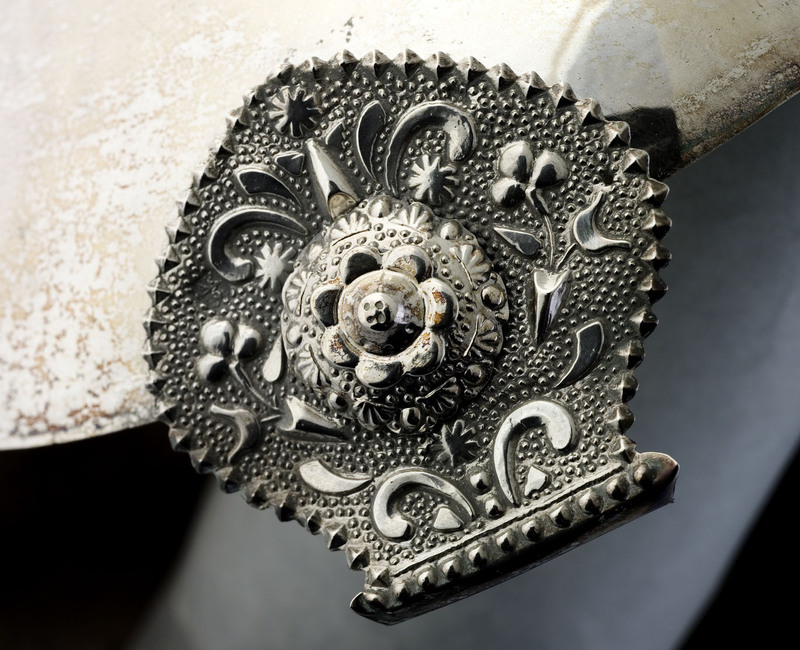 Over the caps is worn the Oorijzer, the 'ear iron'. Here is an old painting showing a young woman about to have her hair cut short so as to put on the adult headdress [and apparently not very happy about it]. 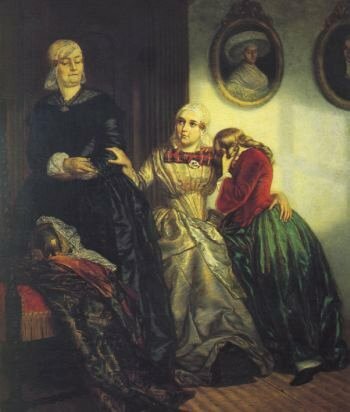 The woman on the left is holding a large pair of scissors, and the lace overcap and Oorijzer are sitting on the chair at left. The Oorijzer is is not unique to this area, it is very common in many parts of the Netherlands, but in Fryslân it is unusually large. 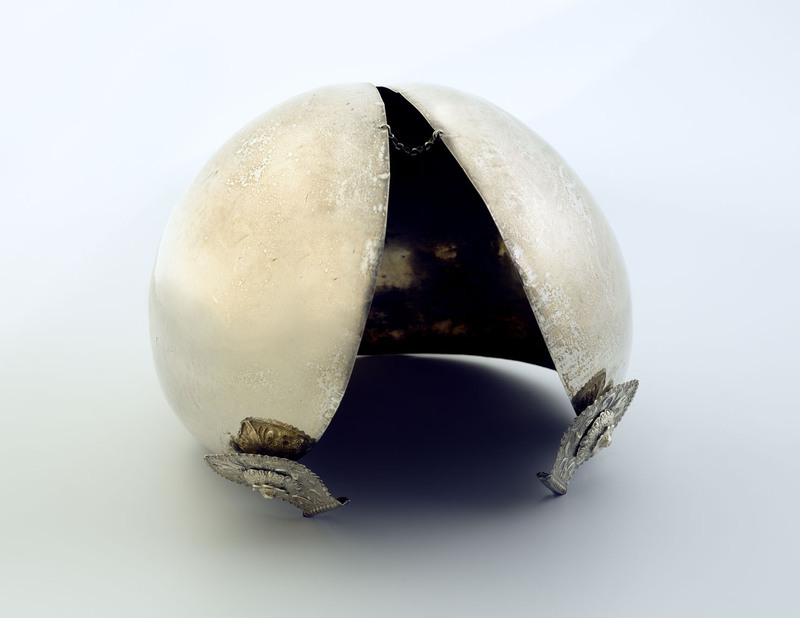 Where it is usually a band of metal with knobs on the ends, here the Oorijzer has become widened almost to helmet proportions. 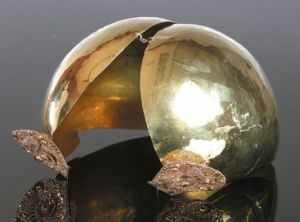 It is usually made of gold, but sometimes of silver. It is made to fit an individual woman, and always has a v shaped opening in front. 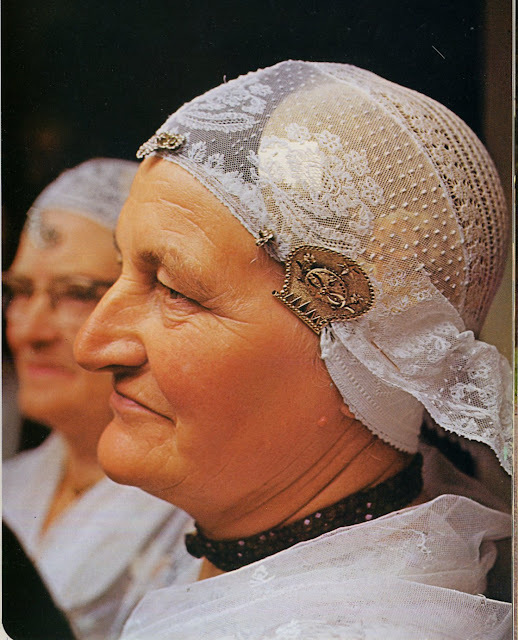 Over the Oorijzer, a lace cap is worn, which covers the black undercap and the Oorijzer. The cap is always made of lace, so that the gold of the Oorijzer shows through. 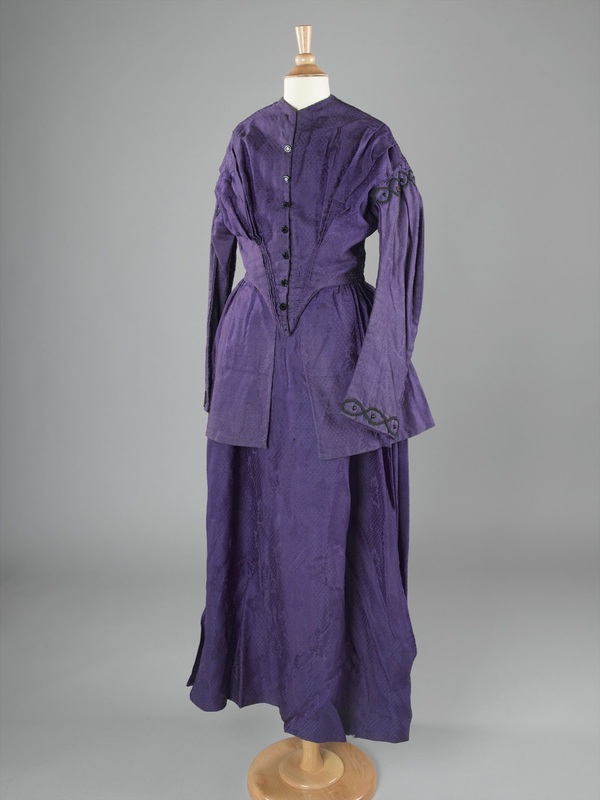 There is a frill in back over the nape of the neck. The 'knobs' are left uncovered, and pins hold the cap in place. The knobs are highly ornamented and sometimes set with stones. 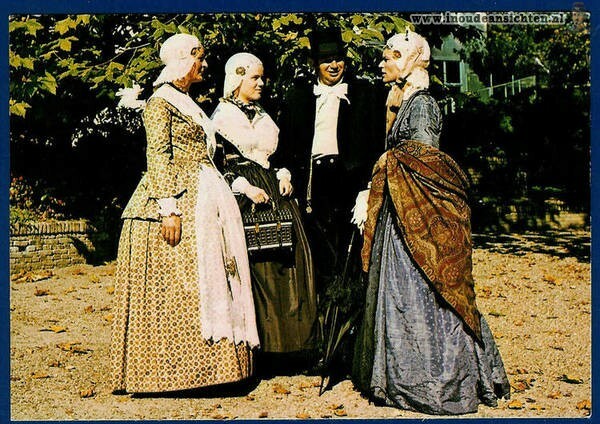 In the 1800's, the frill hung down to the shoulders. 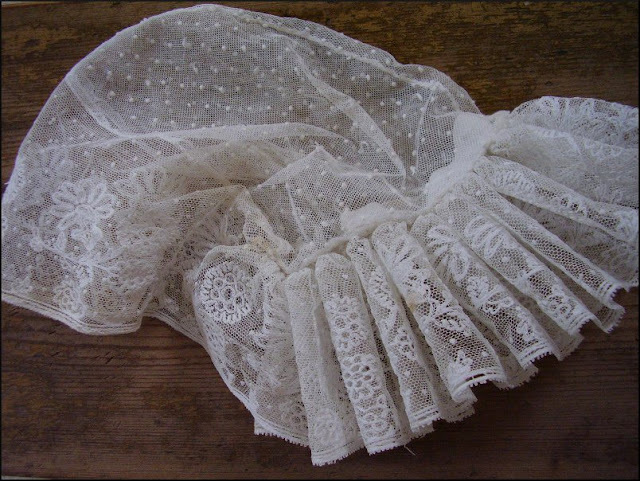 More recently, the frill has gotten shorter, sometimes being reduced to a mere ruffle, which i personally find much less attractive. Here are some examples from different time periods. Over the cap with the frill, a straw hat or top hat were sometimes worn. 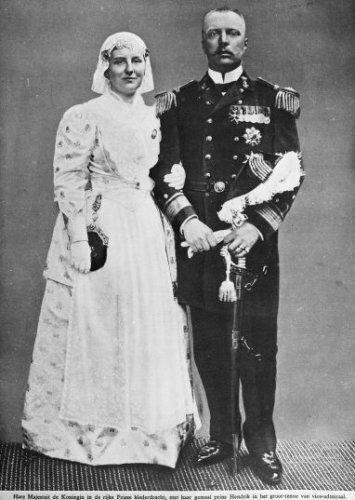 For the men, the costume consisted of cable knit knee socks, buckled shoes, black knickers, tailcoat and top hat, and brocade vest. They also carried silver in the form of watch chains. I wish to voice my support of all those who work to keep this type of clothing a living tradition. 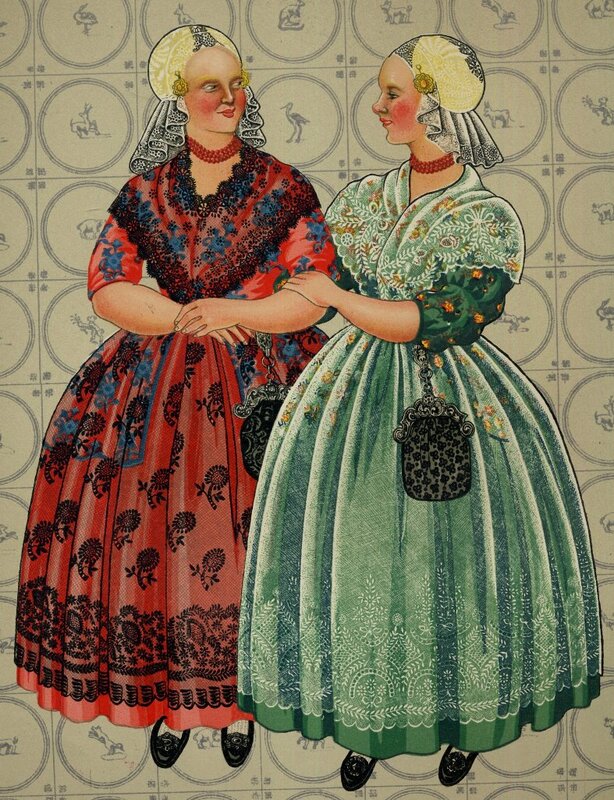 Good wishes to all who work hard to keep their local clothing tradition alive. Your hard work to put together such excellent visuals is greatly appreciated. You answered more than a few questions I had.Thank you, muchly! Terrific! If anyone is interested in the origin of the "golden helmet" it came to me in a Dutch fairytale about a young girl and her conversion & wedding via a website called mainlesson.com. I've only read one or two posts from this blog, but I already love it! Being a folk dancer (both international and Dutch), I am very interested in folk costume and know how hard it can be to find good information when you're not actually in the area. I'm looking forward to reading the rest of it. I am glad that you find this useful. 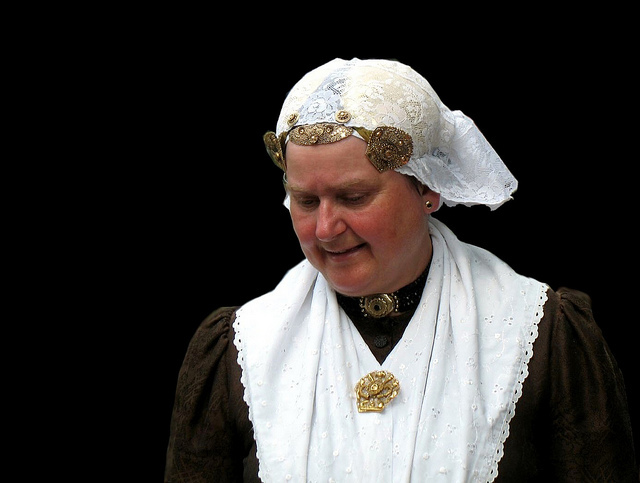 Do you have any information about the funny, fancy, black hat that is worn on top of the oorijzer and lace cap? Do you know what it is called? 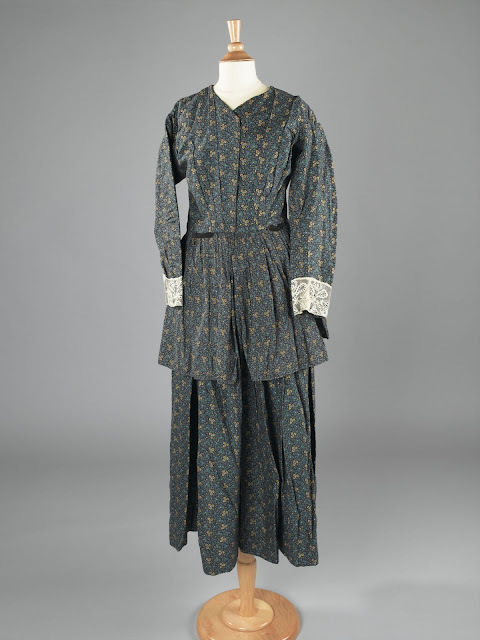 Do you know for what occasion it may have been worn? I have recently made one and would like to know more about it. It is going to be worn in a Dutch show in Holland. Michigan. My daughter told me about West Frisian being the language closest to English, which led me to your site. Very impressive. Thanks for your hard work. 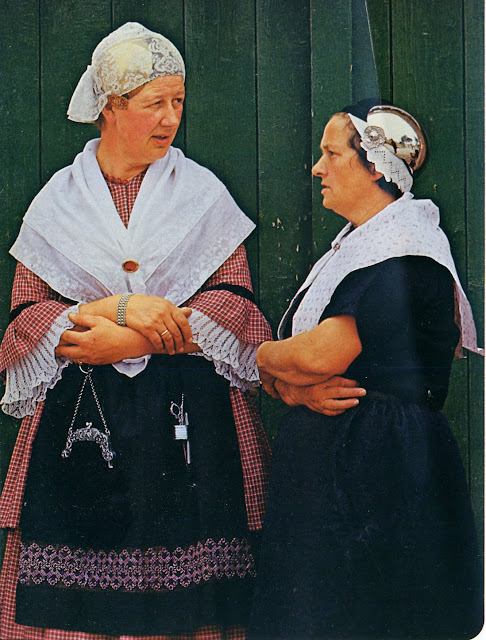 Covering the hair of married women was Universal all over Europe and many other places until recently. There were many superstitions concerning this, and many stories of witches whose hair contained sinister powers. These stories are secondary inventions, the taboo being much older than any of them. One reason for this is to distinguish those who were married from those who were not. Women's hair being one of their primary points of attractiveness is undoubtedly also part of it, a woman who was married did not need to show it off. This tradition is so old and well rooted that it was everywhere taken for granted, and we do not really know why or how it started. There are records of several traditional hair arrangements in various places which were damaging to women's hair. As to why in this region they used gold helmets, it is related to the relative prosperity of the region and the vagaries of fashion. It was a way to show off their wealth, as the large gold oorijzer were clearly visible through the lace caps. 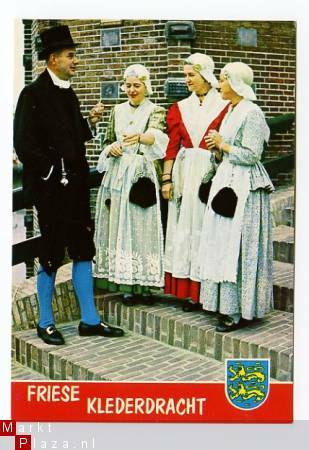 Oorijzer are common over much of the Netherlands, but mostly consisted of narrow metal bands which helped to hold the caps on. My great-great-grandmother had a rather impressive oorijzer (full helmet) which she wore everyday unfortunately she had to sell it to help feed the family during the war. When one of her granddaughters wanted to cut her hair in a short bob everyone turned to the strict family matron for approval, she shocked the family by heartily approving since she had short hair all her life. Thanks so much for all the hard work and research you've done to make such an interesting and informative blog. This is my heritage, so it's all close to my heart. 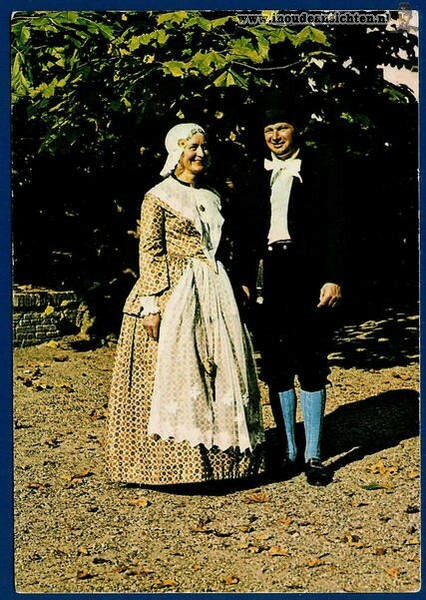 First, my Uncle (who along with my Mom was born in Friesland) was at work one day in the city where he lives in Ontario, Canada, when he heard a man singing from a little book. He asked to see the book. The man handed it over saying, "But you won't be able to understand it--it is Welsh." But my Uncle could read it very well--he said the Friesian was almost identical to the Welsh! 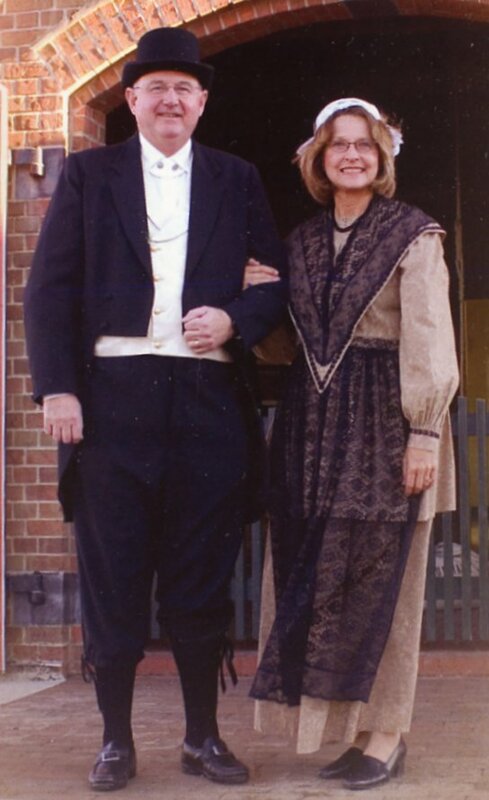 Secondly, my Dad is part Welsh and he married my Mom who is pure Friesian. I would welcome any further information in the similarities of these two Nationalities. Also, I was not aware that there are other Friesians in Germany and Denmark--hurrah! 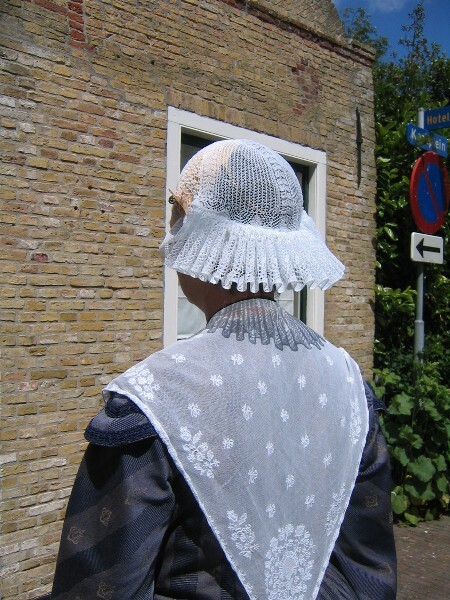 The lace cap over the oorijzer is called a floddermuts. Oh, goodness, this is amazing. I love it. My dad was Frisian, so I am totally interested in this, but hardly found enough information to actually get a proper knowledge on my legacy. 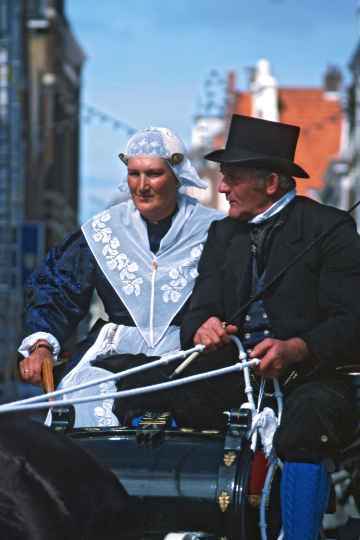 My grandmother actually used to have an oorijzer. I have no idea what happened to it when she died. What I have learned over the years - as I'm living in the UK now - is that Scots Gaelic is in certain ways surprisingly similar to Frisian, and so is Danish, Norwegian and Swedish. When it is written I can understand it as I can read the Frisian language. I can unfortunately not speak it. Thank you for reading. 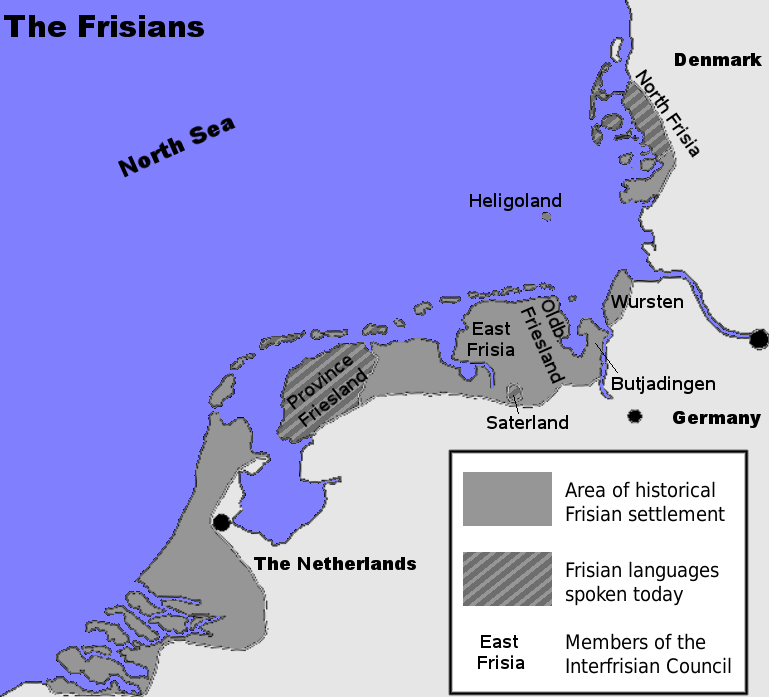 For the record, however, Frisian is close to Scots, not Scots Gaelic. Scots is descended from Saxon, and is a Germanic language, not too different from Frisian or English, Scots Gaelic is a Celtic language; a completely different family of languages. I was led to believe that English and the gaelic dialects were all Germanic languages which would include Frisian, German, Danish, Norse. Saoghal 'na chadal; 's a-mach bho ar soill. The native Celtic languages of the British Isles are completely unrelated to English, which came to those islands with the Anglo-Saxon invaders from Germany. This is a very nice post! Do you have a post about footwear? 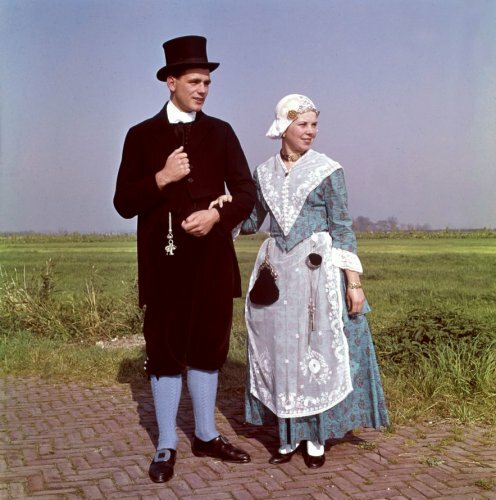 I don’t see any pictures with the Frieslanders wearing wooden shoes, which is refreshing. 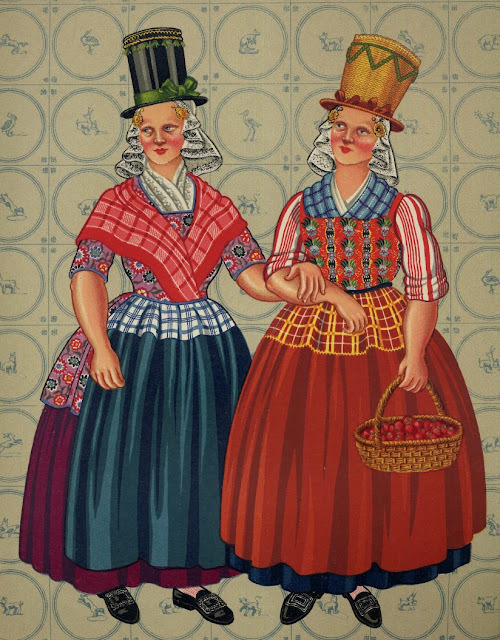 They would indeed have worn wooden shoes when working, which is in fact very common over a very large area of Europe, but not when getting dressed up. Thank you for all your research. 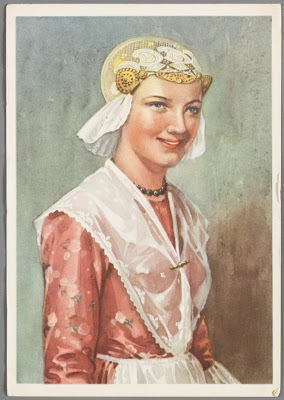 We recently found some wooden shoes, a pair of skates, several lace caps and two of these head pieces in a dusty old box gifted to us. 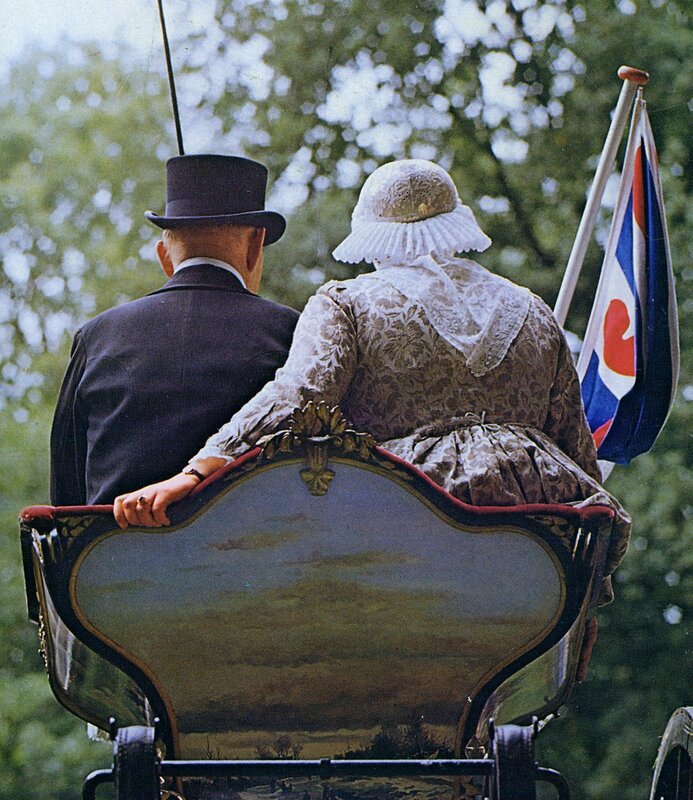 We knew they were dutch but have no idea how they ended up here in America or who they originally belonged to. The only clue was a sheet of newspaper put in the bottom of the box dated 1948. We're assuming somebody cleared out grandma's house about that time and these were treasures brought by immigrants near the turn of the century. Anyway, we're pleased to know more about them and will make sure they have a good home where they will be looked after for future generations. Thanks for your research regarding oorijzers. 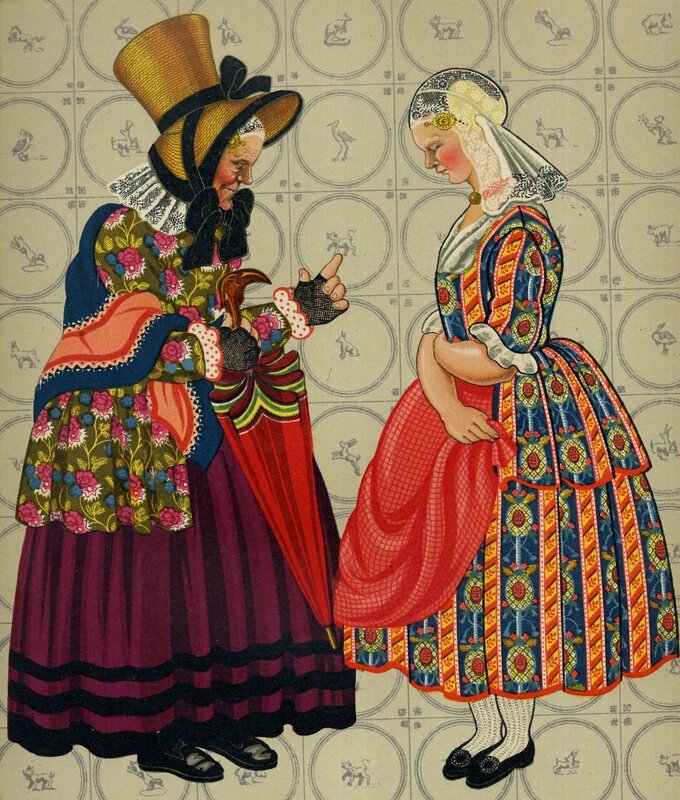 My grandmother (like many of my female relatives back in the late 1800's and early 1900's wore either the silver or gold oorijzer. My grandmother had a gold one (full size) but had to sell it during the Great Depression to put food on the table. While on holiday in Sneek Friesland, I stopped by a Jewelry store and was able to acquire a gold full sized oorijzer - which I still have. I know my grandmother didn't wear it, but someday my granddaughter will be able to say that it belonged to her Opa. ;-).